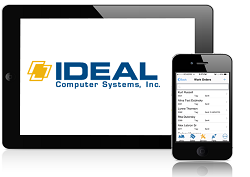 Ideal Computer Systems, a leading provider of business management software for Outdoor Power Equipment dealers, is unveiling new service and parts features that have been added to its mobile app at this month’s GIE+Expo in Louisville, KY. The app, which runs on most Apple and Android mobile devices, serves to help dealers check-in a unit for service, collect customer signatures, email work orders, take pictures that can be attached to a work order and conduct inventory counts. The new service capabilities provide dealers with faster and better customer service by allowing them to take important information on work orders straight from their mobile device and keep more detailed records for warranty purposes. In addition, they can streamline the inventory counting process and expedite their parts receiving process. To see Ideal’s new app in action, visit the Dealer Resource Pavilion or booth #376 at the GIE+Expo.